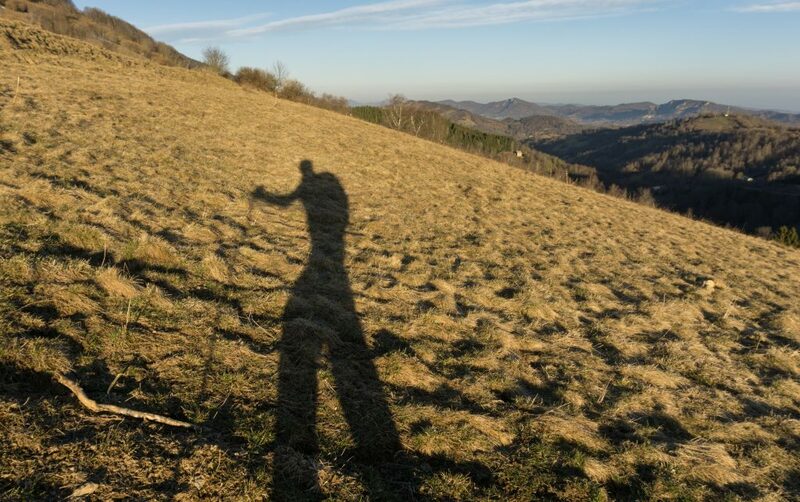 Snowshoeing is a big thing in the Pyrenees. When the conditions are good at the tops, you can meet guided groups or individuals trudging along the ridges to get a bit of winter sun on their cheeks. It’s understandable especially after you count the number of sunny days within an average winter which is a fairly high number. 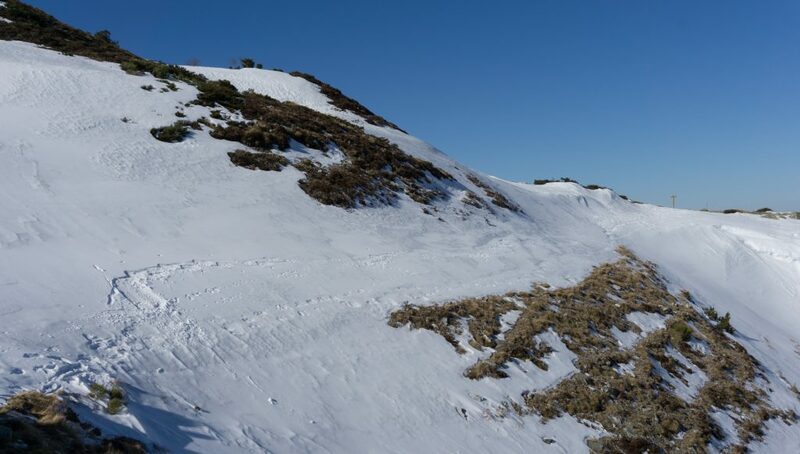 Massif de Tabe in the Cathar Region is a popular ski and snowshoeing destination. The following hike is one of the smaller ones within the range but it’s still about 6 hours long across the plateau le Taulat. Starting at the car park at the bottom of Montségur Castle, go straight up the southern slope. 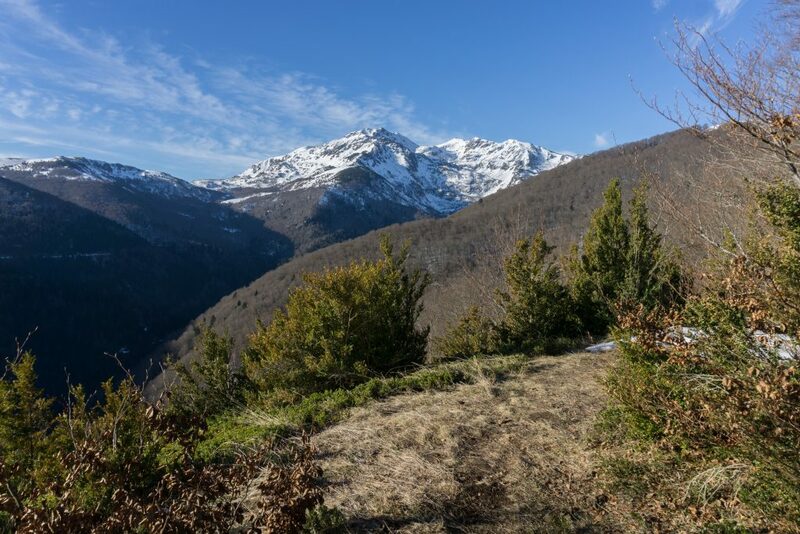 After a brief open part you come to the beech forest where you meet a crossroad: you can either take the path going up straight to Roc de la Gourgue or follow the left turn which would lead you along the slope and back to Montségur. Go straight up and after a while everything opens up and you get a view of Roc de la Gourgue. This whole section is quite demanding, it’s basically a 600 m climb on a steep and muddy/snowy slope. When you reach the plateau Taulat, you get a view to the whole Massif de Tabe. It’s an impressive piece of work and you can actually go across the whole range via a track called Tour du Massif de Tabe. Continue along the ridge deeper into the range. I found this part quite tricky because there aren’t any poles and yellow marks on stones under a layer of snow are not very helpful. Sometimes you have to descend a bit onto the western slope to avoid cliffs which cut the ridge a couple of times forming an illusion of massive waves from the side. Potentially dangerous part without a proper gear. The track is cut into the steep slope and it’s fully covered by ice. You don’t really want to slip here! 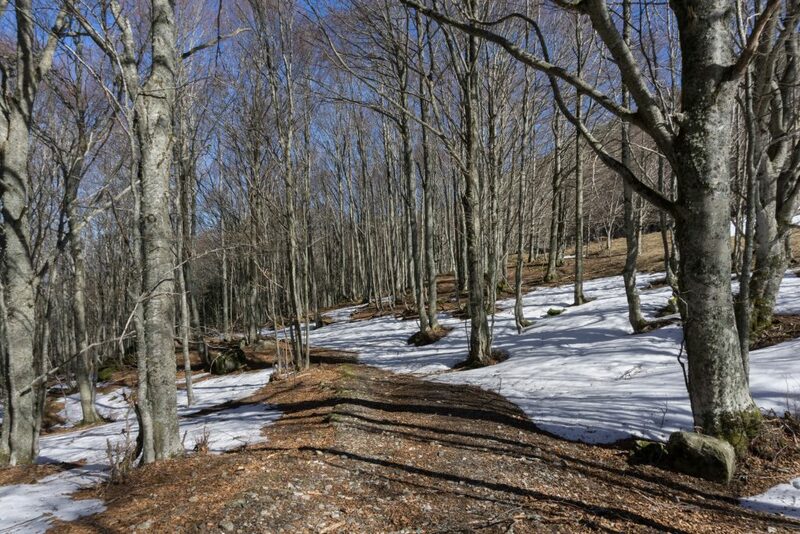 After passing a former farm with a few terraces, you come to a crossroad and the highest point of the walk (1624 m). From there, the track descends towards a small refuge and then the lake Moulzoune. When I walked here, this part was very snowy and it was potentially more problematic than the ridge itself if done without snowshoes or crampons. After passing the lake it’s a lovely and gradual descent through a leafy forest to Ceries. In Ceries you join The Cathar Walk (in French Sentier Cathare) which will lead you through a muddy gorge back to the Montségur carpark. 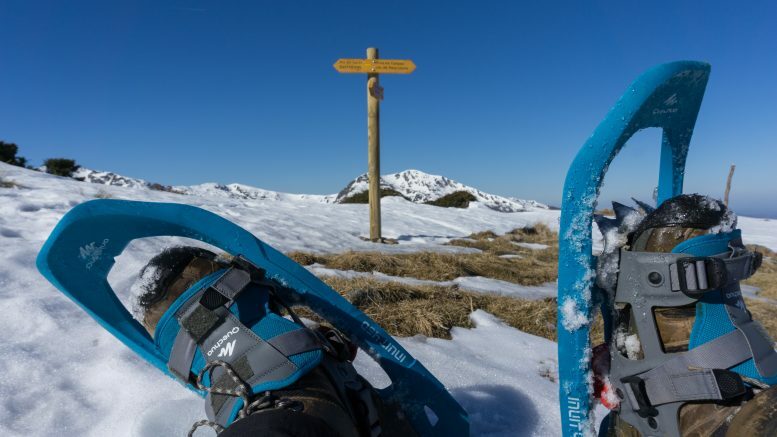 2 Comments on "Snowshoeing trip in Massif de Tabe: across le Taulat"
Giant! You and the mountain both!